There are conventions dedicated to Harry Potter where fans can come together almost every month somewhere in the world. 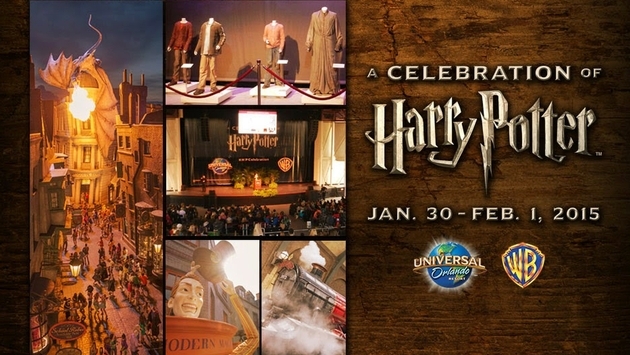 But from Jan. 30 through Feb. 1, 2015 you can celebrate Harry during the event of a lifetime. The three-day event, “A Celebration of Harry Potter,” will include celebrity actor appearances from the films, live discussions and demonstrations and even an expo with hands-on experiences with actual props, sets and people who worked on the films and books. Robbie Coltrane (Rubeus Hagrid), Michael Gambon (Professor Albus Dumbledore), James Phelps (Fred Weasley), Oliver Phelps (George Weasley) and Evanna Lynch (Luna Lovegood) are all scheduled to appear at this year’s convention. Paul Harris, the choreographer of the wand combat in the films, will be on hand as well. Behind the scenes talks from the actors and crew are scheduled throughout the weekend, as well as directors and illustrators discussing their work on the films and books. There is a dueling demonstration and wand combat masterclass being offered from Paul Harris where you can learn to use your wand. There is also the chance to be sorted into your respective house from the Sorting Hat, take pictures with actual props from the movies and for those who are members of Pottermore a chance to participate in the Proudest House Contest. Entry into the convention is free with park admission, but those who purchase excusive event packages will be eligible for special benefits and selected seating. Travel professionals can find out more at www.UniversalTravelAgents.com.